Decorative concretesolutions can raise the aesthetic value of both new projects and renovations, and CHRYSO Southern Africa is able to provide leading edge expertise and products to customers in the region. Since a well-known French decorative concrete company became part of the CHRYSO Group, its offerings have significantly enhanced CHRYSO’s range of concrete additives. It has also added certain technologies to SA-based a.b.e. Construction Chemical’s various market channels. For new concrete, CHRYSO’s solutions vary from stamped concrete and sanded-effect concrete, to exposed aggregateconcrete and luminescent concrete – to name just a few. 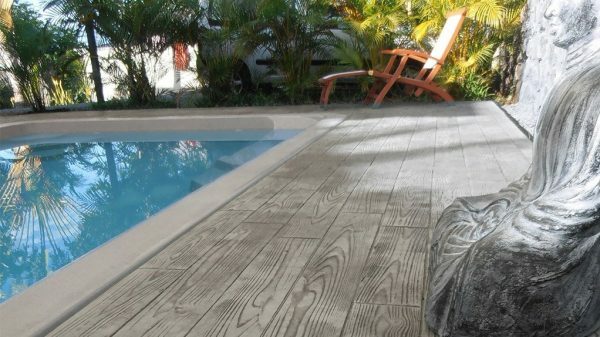 The CHRYSO® DuraPrint process creates unique horizontal surfaces of stamped concrete in applications like pavements and playgrounds, resembling natural materials like stone, wood or paving stones. For walls, whether interior or exterior, CHRYSO® Vertic’Art technology allows decorative effects to be created with use of reliefs, textures and colours on fresh concrete. A non-slip sanded effect is also on offer for new concrete; CHRYSO® GraniStab® makes a concrete slab look like a continuous granite surface, while CHRYSO® ColorStab® gives a stabilised sanded effect that is good for heavy footfall. For both aesthetic and safety value, luminescent concretecontains particles that glow brightly in the dark – making CHRYSO® Lumin P and P+ the perfect solution for pathways, pool sides and patios. The range of products for new concrete developments also includes shaped, pervious and coloured concretesolutions. The products are also ideal for renovating old concrete surfaces, with effects and screeds to rejuvenate the look and durability of worn or damaged concrete. A popular choice for contemporary interiors is the high quality mineral effect provided by the millimetric Béton Ciré range; suitable for hotels, restaurants, homes and other environments, it can be applied on floors, walls, furniture and worktops in a wide range of colours. There is also the Microscreed process, a thinner alternative to stamped concrete, on offer with CHRYSO® RenoPrint – creating the appearance of natural materials but measuring only 6-10 mm thick. An even thinner coating of just 2 mm is available with CHRYSO® Texture Top® – suitable for esplanades, pavements, terraces and paths; the textured surface over old concrete is anti-slip and provides excellent mechanical resistance. The products for concrete renovations include a quick-drying resin finish for outdoor (CHRYSO® ResiCoat), patina’s for restoring colour (CHRYSO® ColorTop Patinas) and ink dyes for dense and polished concretes.